An incident occurred on Sunday, August 29, 2010 only 5 minutes in to the day (just after midnight Saturday night) involving what appears to be a run-away 18 wheeler at a very high rate of speed (anticipated to be at/near 100 mph) that slammed in to a law abiding driver's vehicle. The victims in the accident were towing a trailered vehicle. Misrepresentation and fraud appeared to be present at the wreck/scene wherein the driver of the 18 wheeler Frank R. Delgado (Yera) gave false evidence of insurance coverage at the scene. Delgado was driving a truck said to be owned/operated by Osmar Oliva. Fraud at the scene was followed by poor investigation of the loss. Meanwhile, the insurance company DENIED liability in the high speed rear-end collision, and lied repeatedly about their reasoning behind it. When advised that they were operating in bad faith and committing fraud they ignored the advices. The CEO and home office of the parent company (Tower Group) was involved. The CEO Michael Lee of Tower Group apparently had someone respond and endorse the behavior on his behalf out of New York. The respondent Lowell Aptman backed/endorsed the unlawful behavior of the claims personnel operating under the guidance of John R. Pecoraro of Tower Group/CastlePoint from their Miami office. At the time Pecoraro was working at what appears to be some form of shell of protection for the parent company, but since Pecoraro has been promoted to a position over all claims activity for the state. Pecoraro, Michael Lee, and others were advised of the fraud. The unlawful behavior continued. Filings to the state agencies are seen at the right side bar of this page. 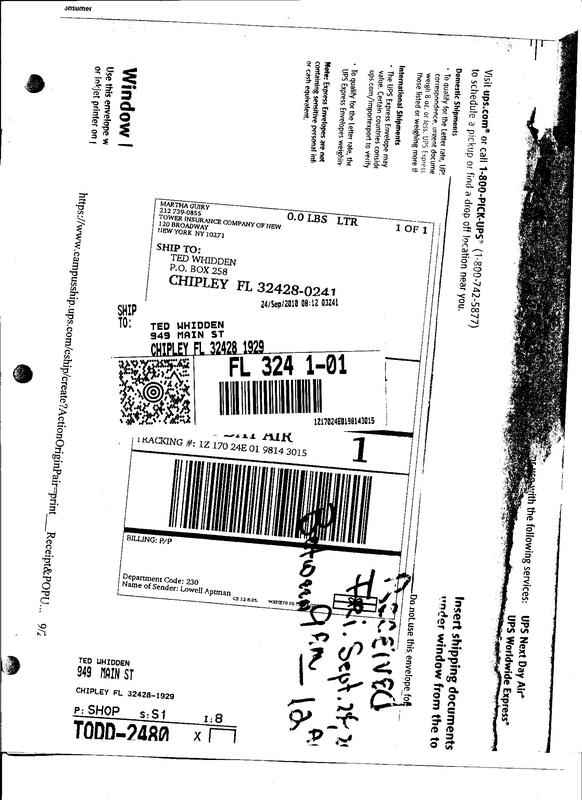 They continued filing what appears to be deceptive filings to the State Commissioner of Insurance in Florida, and placed the deceptions (fraud) in the U.S. mail, thus committing Federal Mail fraud. This not only looks to me like a premeditated process and way of doing business, it looks to me like a corporate pattern or culture of fraud. Following numerous notifications in writing acknowledged by Tower Group, it seemingly indicates they knowingly, willingly, and purposefully committed the acts, and advocate abuse of the legal system it appears by insisting the only course of action is civil litigation. Legal filings (See right of this page) in the Florida system have been initiated and additional filings in Florida, New York, and Federal courts are anticipated. Evidences to support the loss are contained herein, with links to much of the pertinent information on the Internet. As the website www.FraudDocumentation.com is further developed additional documents and correspondences will be made public. The victims of the crash were abused physically at the crash scene by the horrific event, and have been insulted, abused, and lied to by the claims personnel since the event. They continue to press on with substantial permanent and personal damages. The tactics of the Tower Group family of companies appear to offend virtually every legal code within the state of Florida. It seems a matter of their course of business, because thus far a filing has been made against everyone who has touched the file on behalf of the group. Class action litigation may be in order, with state, interstate, and federal investigations warranted. Multiple state filings or "Civil Remedy" filings have been made pursuant to Florida State Law (See links right and links to personnel. Additional links and information to be released). The Florida state system for these filings requests victims wait 60 days for the violator/insurance company to attempt to address or resolve the issues. Thus far multiple filings have attracted nothing but ridicule and abuses from the claims manager Pecoraro. Pecoraro has stooped as low as making fun of what was considered a deaf, mute, comatose victim of the crash, and continues his stance and approach using fraud, attempted fraud, and numerous tactics appearing to operate in "bad faith". His staff members have been sent copies of Florida Insurance ethics code and Florida Insurance Law, because they do not seem to operate with knowledge of this code. Rather than mitigating losses for his client company Pecoraro has drastically increased their exposure. Fraud typically has no statute of limitations, no limit of liability, and the violations committed by the offender in no way affect the loss itself. Tower Group and CastlePoint still remain liable, but their exposure seems to have mushroomed to cover all their companies, subsidiaries, directors and stocks. 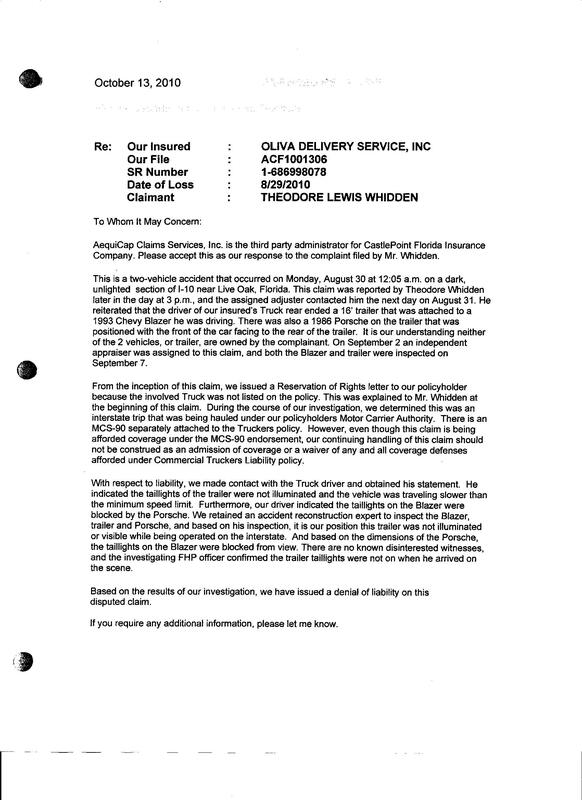 CastlePoint/Tower Group utilized what now appears somewhat like a "shell company" called Aequicap to handle their claims. Aequicap appears to have gone in to bankruptcy in Febuary 2011, and Tower Group appears to have taken over their book or business, AND hired the claims handlers who had already been reported to Tower Group for their behavior. Since the frauds and notifications of fraud and fraudulent dealings, Tower Group has hired and promoted the people whom had previously committed these acts under their employ. The behavior continues (apparently) with the full knowledge and oversight of the Board of Directors and parent company, Tower Group. It looks like a pattern of business and their corporate culture. The victim went to New York and notified the General Counsel (Elliot S Orol) and other board members and directors. They have failed to respond. 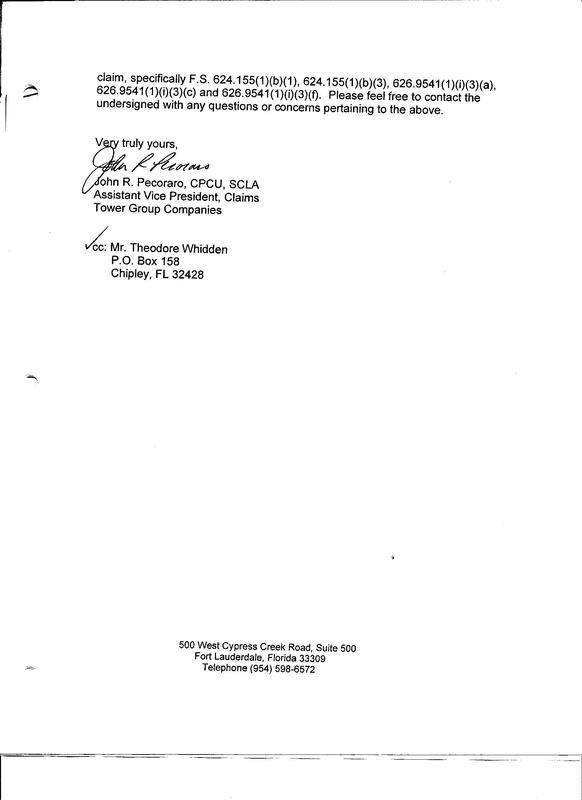 May 2011 ethics and code of conduct investigations requested via CPCU, SCLA, DBPR, Attorney General, District Attorneys, and the State of Florida regarding John R. Pecoraro and his endorsements. For the many violations and obvious failures of CastlePoint and Tower Group to address these issues we have decided to feature this loss as our opening "feature" company. Correspondence listed herein applies in one manner or another to the case/claim with which www.FraudDocumentation.com makes its debute. Additional correspondence will be added or removed as necessary for clarity and to follow the continuation. Some of the more pertinent/interesting messages are highlighted in red. Since the vast majority of this file is letter/correspondence based this could serve as a basis for a timeline study and a chronology of events/discussions. August 29, 2010, 0005 hours, only 5 minutes after midnight (Saturday night moving in to Sunday morning) a wreck occurs near milemarker 274 on Interstate 10, Suwannee County Florida, near Live Oak. The deceptions of the at fault insurance company begin almost immediately, and progress until the time of this posting. 2010.9.19 FourPage.htm, This is the first major notice to the claims criminals handling the claim. It is rather long and self explanatory. The issues and events covered herein are apparently part of a law enforcement investigation series by state officials. 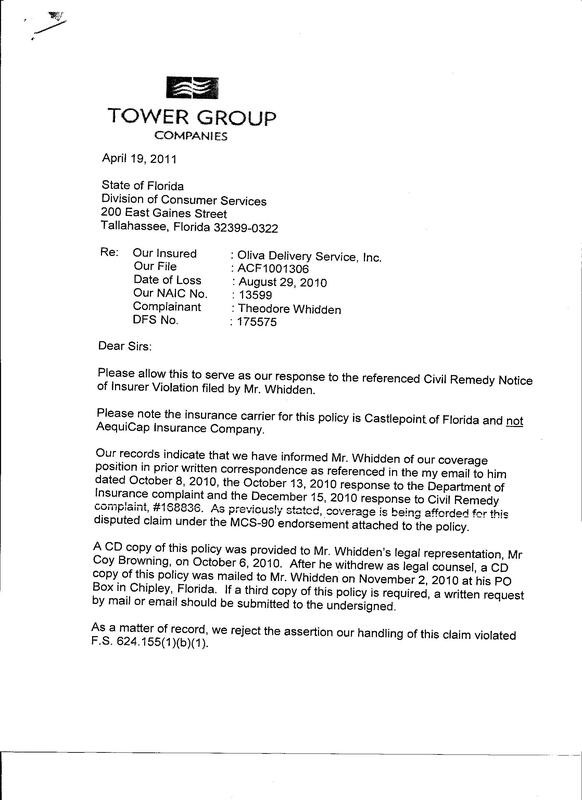 2010.9.21.TW2MichaelLee.htm, In this email to Michael Lee, CEO of Tower Group/CastlePoint/Aequicap as it relates to this issue the company's head is notified of the abusive nature of the case/claim/handling only 3 weeks after the incident. Eventually someone from the CEO/Parent responds behalf of CEO Michael Lee apparently endorsing the bad behavior. One can see under the Lowell Aptman listing info in this regard. 2010.9.21Commissioner.htm, This is a unique message as we look at it in hindsight. The victim of the accident clearly identifies hooligan tactics of bad faith, abuses, fraud, etc to the State Commissioner of Insurance. NOTE THE DATE and the apparently "prophetic" referrals to a deviant management system. When the manager arrives on to the scene these things anticipated come to life, and continue for months, with repetitive behavior to solidify the deviant activity and motives. 2010.9.22.MarlenRuiz2TW.htm, Marlen Ruiz of Oliva Delivery Services advises that Keisha Pusey is on the claim. 2010.9.22.TW2MarlenRuiz.htm, This is another rather "prophetic" message sent to the Trucking Company (Oliva Delivery Services) concerning the potentially criminal behavior of the adjusters Rori Strickland and Keisha Tanisha Pusey under the direction of John R. Pecoraro it would appear. 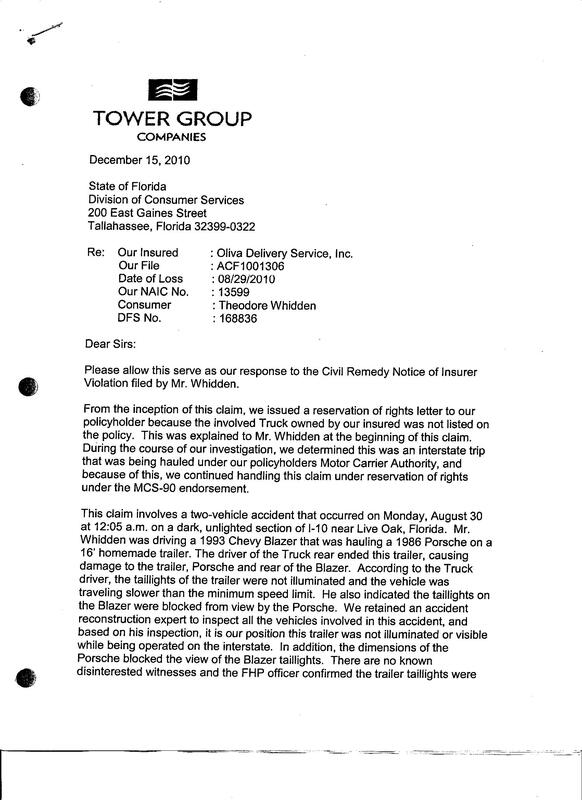 2010.9.27.ChrisDunn2TW.htm, State of Florida response/advice of open and ongoing insight in to the claims handling less than one month following the wreck. The response Aequicap/Pecoraro sent to the state regarding this will likely constitute fraud in his state filing. 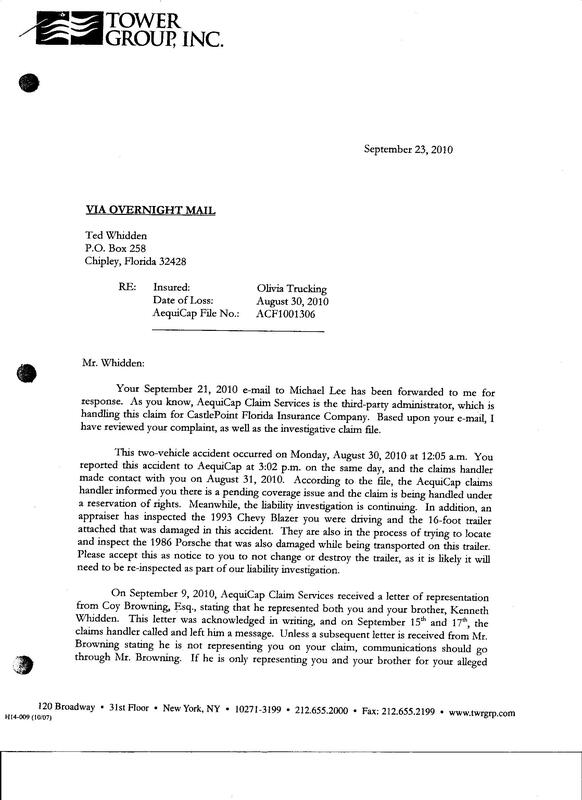 2010.9.28.TW2KeishaPusey.htm, Ted Whidden sends this email to Keisha Pusey the day prior to her sending the "forensic expert" David Brill to examine the vehicles, exactly one month after the wreck. 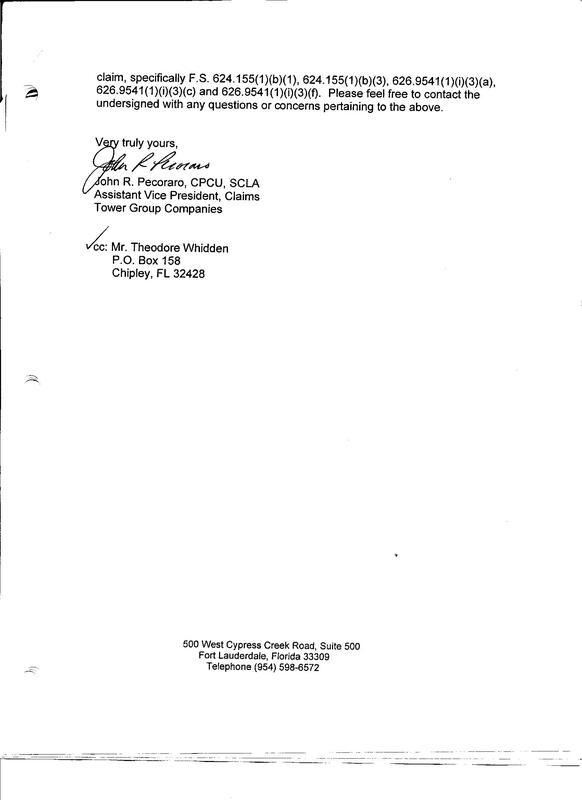 2010.9.28.TW2MarlenRuiz.htm, Ted Whidden forwards email from State of Florida to Oliva Delivery Services so they are aware of the oversight being given by the State. 2010.9.28TW2KeishaPuseyandAll.htm, Ted Whidden asks Keisha Tanisha Pusey to refer the file to someone of greater integrity, yet again. 2010.9.30.TW2DavidBrill.htm, Ted Whidden sends David Brill the forensic expert an email reminding him that we both agreed to record our meeting and discussions. He is encouraged to submit his to his client to bring them up to date on our discussions. Discussions with David Brill are partly revealed on the David Brill page. Click and see. 2010.9.30.RoriStrickland.htm, Auto-reply from Rori Strickland from message sent by Ted Whidden to David Brill with copies to the Aequicap bunch. 2010.10.1TW2KeishaPuseyMichaelLee.htm and 2010.10.1 EightPage.htm Are two copies of the same masterpiece written and sent to the CEO of Tower Group/CastlePoint and all the claims people at Aequicap, AS WELL as an email request made of the adjuster Keisha Pusey to forward the mail/package to CEO Michael Lee. This should demonstrate clear knowledge of the disaster unfolding. 2010.10.01.TW2MichaelLeeLowellAptmanALL.htm, This letter was sent certified to Michael Lee and those listed addressing the letter by Lowell Aptman. This letter as well as the 2010.9.19 letter is acknowledged by the claims manager John R. Pecoraro when he makes his initial introduction to the victims in his October 8, 2010 email soon to come. 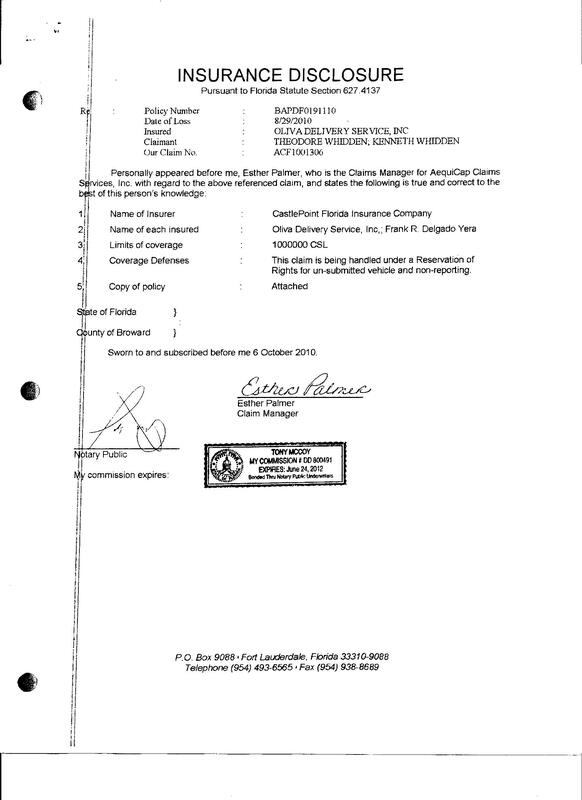 2010.10.6 Esther Palmer signs an Insurance Disclosure. 2010.10.7.TW2KeishaPusey.htm, Ted Whidden sends Keisha Tanisha Pusey an email outlining her deceptions and that of her counterpart Rori Strickland. 2010.10.8TW2MarlenRuiz.htm, Ted Whidden forwards Pecoraro's crazy October 8, 2010 email introduction/deception to Marlen Ruiz. 2010.10.8TW2PecoraroALL.htm, Ted Whidden's response (copy to all) regarding Pecoraro's email introduction/deception/fraud of October 8, 2010. 2010.10.11TW2PecoraroALL.htm, Ted Whidden responds to and advises Pecoraro of his early violations, bad faith, misdealings, corruption, fraud, etc. Pecoraro is advised/warned on October 11, 2010, then makes a dishonest, fraud full filing on October 13, 2010 to the State of Florida. See next entry! 2010.10.13 John R. Pecoraro's first state filings in the loss referred to herein contained frauds, deceptions, concealments, misrepresentation of material fact, and more. He knowingly and willingly lied to state officials in his filing in an effort to avoid liability in what his own investigator stated was a million dollar loss. The first filing made by Pecoraro's organization at the time is found at www.FraudDocumentation.com/media/statefiling1Aequicap.jpg . Note: This filing was made to the state and not sent to the victims/offended party as required. To obtain copy of this document a Freedom of Information Act discovery was required. It almost makes sense that Pecoraro would try to hide his deception and fraud in this manner. November 1, 2010 a second filing (first one through the Civil Remedy System) is filed. November 5, 2010 a third filing (second through the Civil Remedy System) is filed. 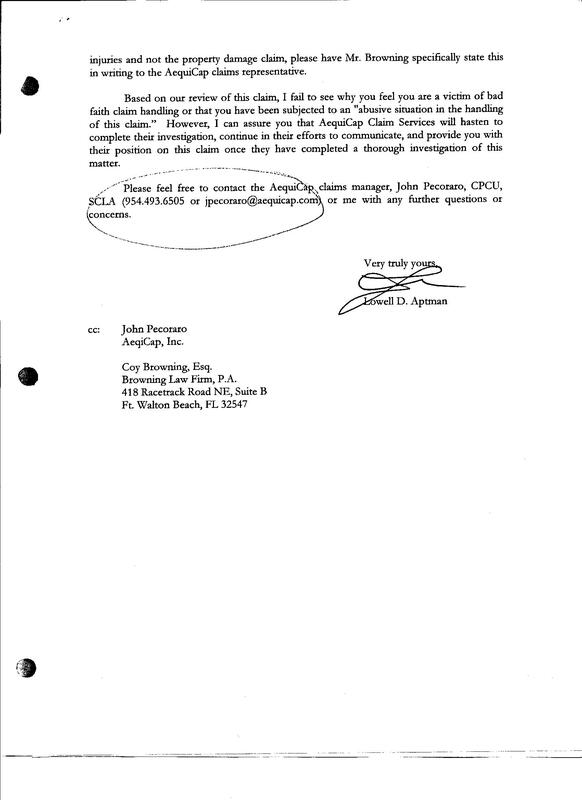 December 15, 2010, Monica Sturm of Aequicap (Later to be part of Tower Group) posts a response to the Civil Remedy system on behalf of John R. Pecoraro making herself part of his game of fraud and deception. 2010.12.27 John R. Pecoraro is sent a copy of the document demand for trucking documents. On December 30, 2010 he signs for same. 2011.2.23 Monica Sturm NOW of Tower Group (she made the transition from Aequicap) files a Civil Remedy response on behalf of John R. Pecoraro of CastlePoint, making herself once again part of his deceit, deception, denial, and fraud. 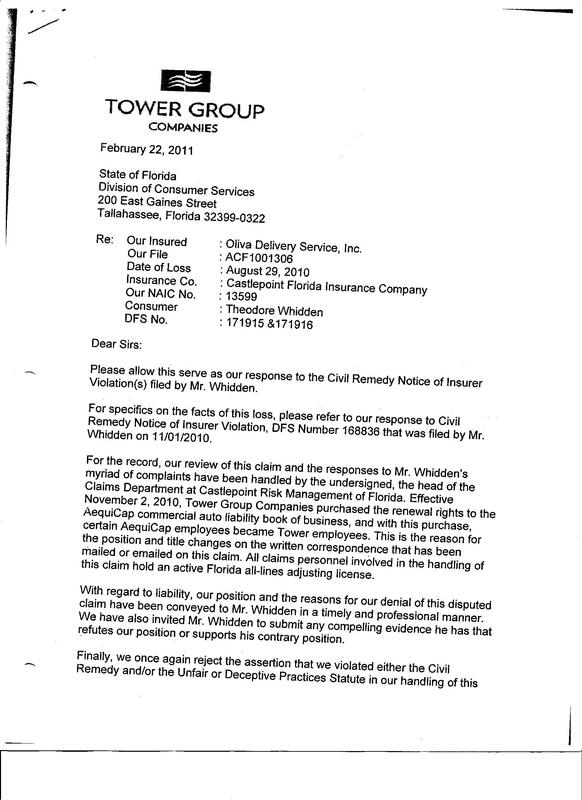 2011.2.23 Monica Sturm NOW of Tower Group (she made the transition from Aequicap) files a Civil Remedy response on behalf of John R. Pecoraro of Aequicap/CastlePoint, making herself once again part of the confusion and furtherance of deviant behavior. 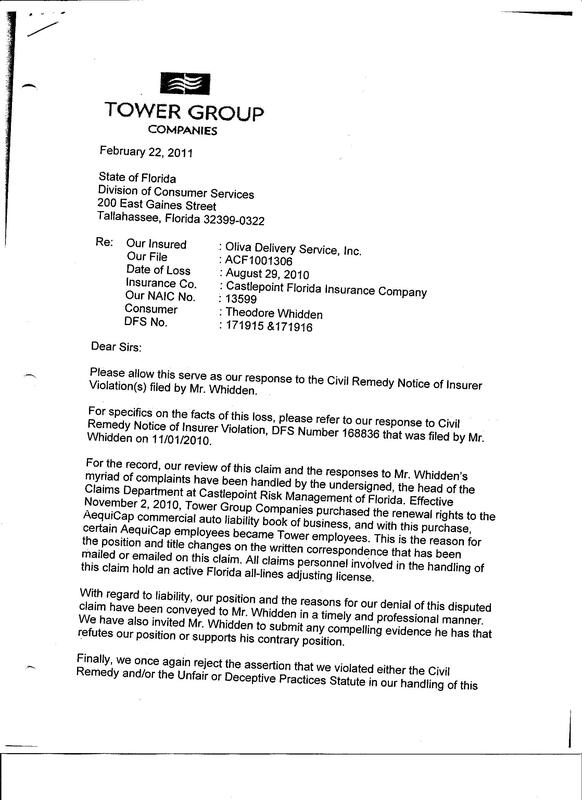 2011.2.23 Monica Sturm NOW of Tower Group (she made the transition from Aequicap) files a Civil Remedy response on behalf of John R. Pecoraro of CastlePoint, making herself once again part of the confusion and furtherance of deviant behavior. 2011.3.7 Yet another filing against Aequicap. The point of this filing is the improper insurance verification given by the driver at the wreck scene. 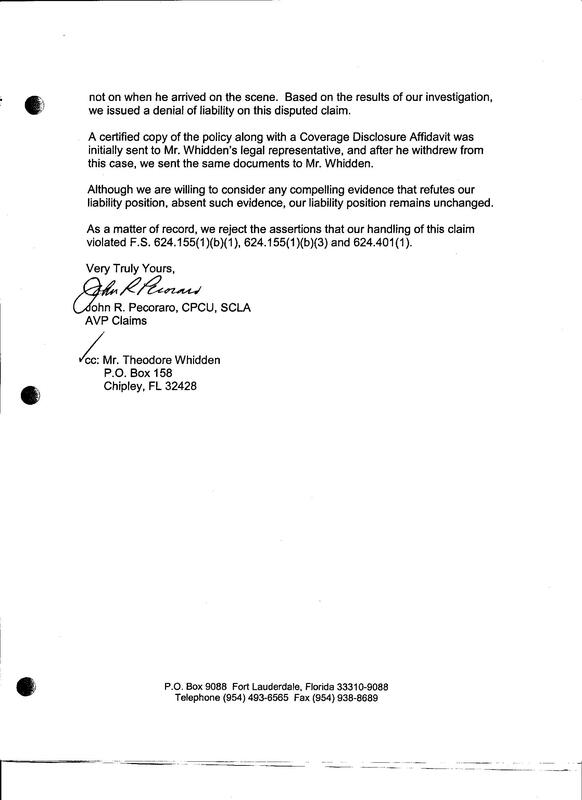 In John R. Pecoraro's response he incriminates his assured/client by his response making fraud at the scene perfected at the wreck site, and Pecoraro himself is not a witness/proof against his own assured. 2011.3.14.TW2KeishaPusey.Strickland.htm, Ted Whidden asks adjusters if their investigation is complete. Of course if it "is" complete they must explain why they have no information. If it is not complete, then they must explain why not. All adjusters involved are in violation of failure to properly investigate, failure to make offer to settle, and other charges. 2011.3.15.TW2PecoraroTowerGroup.htm, Ted Whidden shows in great detail many of the frauds, crimes, and material mishandlings of John R. Pecoraro and his staff under his direction. Pecoraro's numerous frauds are revealed to him. This email is copied on to Pecoraro's parent company, but no response. On March 23, 2011 the entire Board of Directors was notified of what was taking place. No one responded. 2011.3.24Pecoraro2TWredressincourt.htm, In this email John R. Pecoraro insists on "redress thru the court system" following his deceptions, frauds, bad faith, etc. To this point he and his team appear to have violated virtually all insurance and ethics rules/laws. 2011.5.20, Almost 9 months after the wreck no offer has been made by the at fault party and they refuse to meet, negotiate, and insist on litigation despite the fact they knowingly, willingly have committed numerous frauds. It appears that to this point we have either failed to reach the responsible party, a reasonable party, or a liable party. A series of Civil Remedy filings is stage to attempt to reach a party with integrity and/or stir to action a reasonable, responsible party, because they clearly have not been stimulated to move to action yet. See Florida Filings. 2011.5.24, Message sent to Elliot Orol (Legal Counsel for Tower Group and Castle Point). Elliot and his gang failed to reply. 2011.5.27 Message sent to the Tower Group/Castle Point/Aequicap gang regarding victim standing by in New York awaiting a meeting. 2011.5.27, Laurie Ranegar autoreply. Auto-replies such as this demonstrate that the corporate offices were receiving (and ignoring) our requests for integrity and reasonable involvement/intervention. Note: For clarity the e-mail her system was responding to is included showing a long list of those who acknowledged or failed to respond to the same message. 2011.5.27 Bounced mail from the Tower Group Gang indicating mail delivered to all other recipients. 2011.6.5 Email sent to Elliot Orol of Tower Insurance and his Board, office, and those implicated (with auto-reply from Martha Guiry). 2011.7.4 Email sent to Elliot Orol, Michael Lee, and the gang advising them of the CPCU Ethics Probe and Code of Conduct Review of John R Pecoraro. Note Auto-replies from both Gary Maier, and Martha Guirry acknowledging receipt of mailing. 2011.7.5 Email sent to CPCU's Donna Popow regarding Fraud-based ethics violations and code of conduct review for John R Pecoraro. 2011.7.8 Email sent to Jim Prendergast who is the lawyer appointed by the CPCU/Ethics Counsel to review the complaint(s) against John R Pecoraro. 2011.10.6 Email sent to CPCU's Donna Popow regarding revisiting their initial ruling on John R Pecoraro and his apparent fraud violations. 2011.10.8 Email sent to Elliot Orol and Tower Group personnel. Note numerous acknowledgements at bottom of page. 2011.10.10 Email sent to CPCU Donna Popow as the SECOND Ethics and Code of Conduct complaint for frauds by John R. Pecoraro. Notice numerous links sent to to Tower Group personnel. Note: It appears Tower have modified their internet mail delivery and response system. 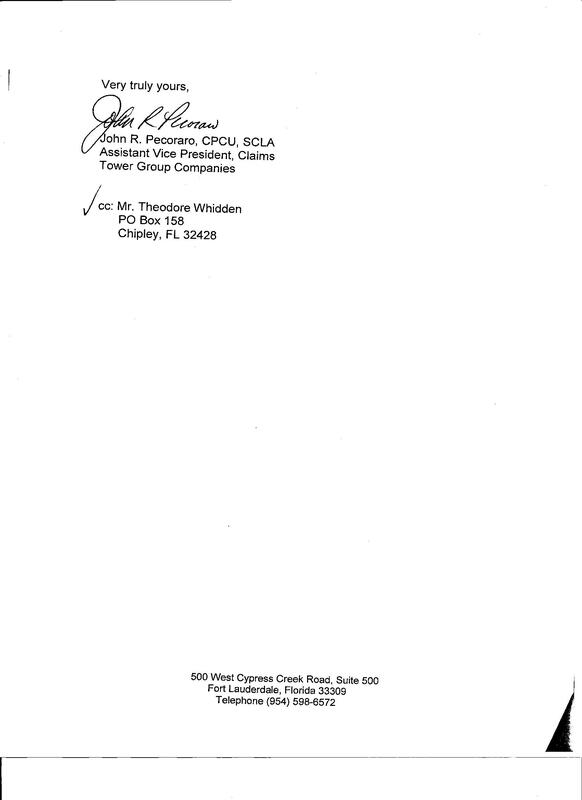 2011.10.24 Thomas J. McCausland sends his first letter/email regarding his assignment to resolve the loss/incident issue on behalf of Tower Group Companies. 2011.10.25 Email submitting third ethics and code of conduct filing against John R Pecoraro, including letters and Florida Bar filing against Jack T Frost. 2011.10.28 Email sent to Jim Prendergast of the CPCU/SCLA ( "The Institute" ) regarding review of John R Pecoraro's bad behavior. 2011.10.31 Thomas J. McCausland sends 2nd letter/email regarding his assignment to resolve the loss/incident issue. His client is copied, but not named. 2011.11.11 Thomas J. McCausland sends his 3rd letter/email with a follow-up copy sent by regular mail. In this letter McCausland indicates he has been appointed by Tower Group Companies to "settle" the claim. 2011.11.15 Response sent to Thomas J. McCausland, Elliot Orol, Michael Lee, etc in an effort to resolve the litigious issues of their apparent unlawful handling of the loss. 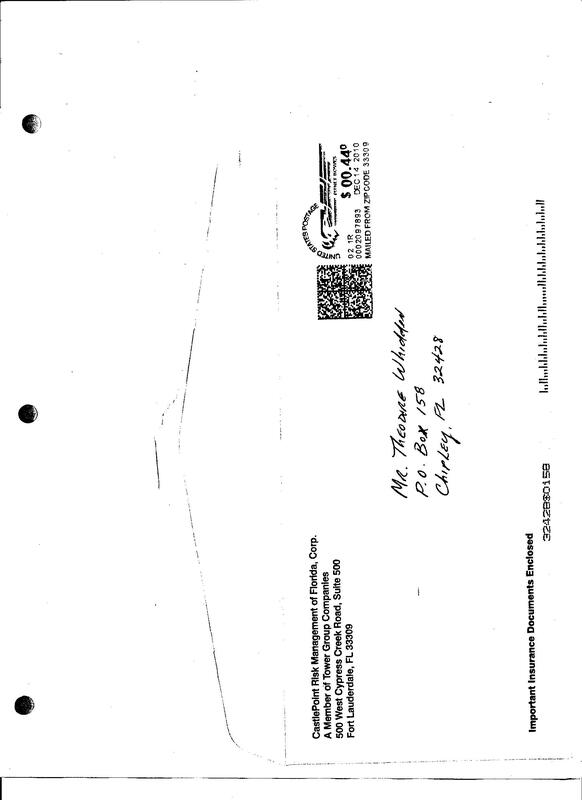 2011.11.23 Thomas J. McCausland sends an email which may constitute multiple frauds, attempts at fraud and other violations on behalf of himself, his firm, and his client. 2011.11.25 Victim of the accident/claims mishandling contacts Oliva Delivery Service (Osmar Oliva/Marlen Ruiz) to see if they have appointed counsel as indicated by Thomas J McCausland' letter of 11.23.2011. 2011.11.28 Marlen Ruiz of Oliva Delivery Services responds advising they have not appointed legal counsel.